Alexander Stubb is former Prime Minister of Finland and contender for the European People’s Party’s Spitzenkandidat position. In an exclusive video interview for EURACTIV, Stubb spoke to Alexandra Brzozowski and Beatriz Ríos about his candidature. 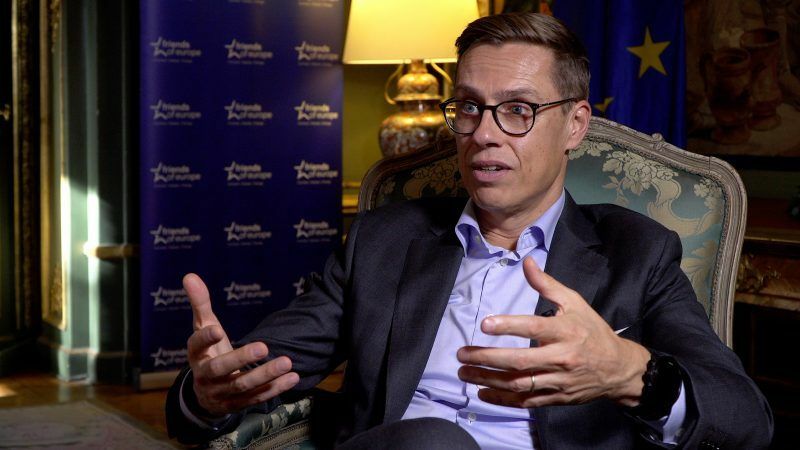 While on unpaid leave from his position as vice-president of the European Investment Bank, Alexander Stubb announced his desire to lead the EPP into next year’s European elections as a possible Spitzenkandidat. Too extrovert for Finns and too liberal for his own party, he belongs to the most progressive wing of the conservatives. For now, Stubb has avoided direct confrontation with his opponent, German MEP Manfred Weber, who counts on the support of powerful German Chancellor Angela Merkel. However, the odds might be in Stubb’s favour due to his government experience, which Weber lacks. Mr. Stubb, why did you decide to enter the Spitzenkandidaten race in first place and do you think that opposing a German candidate without previous government experience could play in your favour to be elected EPP lead candidate? If I were to say in one word, why I am running for Commission president, it is values. Because I firmly believe and am afraid that European values, human rights, fundamental rights, equality, tolerance, rule of law, liberal democracy… are all under threat at this particular moment, from outside of the Union, from inside of the Union, and perhaps from inside of the EPP as well. I think in times of uncertainty you need to anchor onto something, like these values. I want to defend these values. That is the main reason for running. 2016, in particular, was a rough time for us, who call themselves liberal internationalists or pro-Europeans, or whatever you want to call us. It is time to be on the barricades. What are my advantages in comparison with my “competitor” Manfred Weber? I have never compared myself to anyone else, really. Manfred and I are good friends, we both joined the European Parliament in 2004 and then our paths deviated in 2008 when I became Finnish foreign minister. Then, subsequently, prime minister, finance minister and I was in government for 8 years. I am a bit of an EU nerd, I know the EU institutions inside-out. I have worked in all of them pretty much: the Council, the Commission, the Parliament and now the European Investment Bank. But probably, I guess the toughest schooling that one can have is to be in the European Council. Both as a deputy ‘antici’ taking notes, and then behind the microphone. That’s my experience – and I only speak for myself, not for other candidates. European values are clearly under threat also from within the EPP. How do you feel about Manfred Weber’s “flirtations” with Salvini and Orbán? Is there any intention for the EPP to collaborate with the more hardline right-wing parties? For me, the EPP is about values – and certainly far-right is not a value that the EPP holds true. I don’t like the flirtations with Salvini, or with PiS in Poland, or with any illiberal elements of European values. I think we need to split this into two. One side is the question of what the EPP does stand for. If you don’t stick to EPP values and rules, then you should be out. Go do something else. The second side is, who do you work with after the elections? And there, I think you have to be realistic. Because the truth is that probably we are going to have very messy election results. We have populists from the left and right. I would like of course to see a strong centre-coalition of the mainstream pro-European parties. I have had experience in dealing with coalitions. We had the ‘True Finns’ in our government. Now the ‘True Finns’ are not in the government anymore, their popularity is half down and the party is split into two. That’s what happens when you get into power. Am I saying that we should hug all the populist to death, as we did in Finland? The answer is no, there are no easy solutions. We need to take populism seriously, but it doesn’t mean that populism has to be brought into the EPP, quite the contrary: Stay out. As you mentioned, the results of the upcoming elections are likely to be messy and therefore may lead to broad coalitions. Emmanuel Macron is likely to play an important role in the elections, too. Do you believe, like he does, that this vote will be a face-off between populist forces and progressive Europeans? How do you think Macron could shape the campaign? I think this election is not necessarily going to be so much about left versus right, populists versus progressives. It is going to be more about localists versus globalists, pro-European versus anti-European, nationalists versus anti-nationalists…It is important that we forge the sensible centre that can drive the European integration process forward. I am obviously three things: I am pro-European, I am positive and I am pragmatic. What I am trying to push for is more Europe where is necessary and less Europe where it is not. At the same time, I don’t want to be the person who incites hate and fear to drive the political agenda. There are many people in political positions now that do that, they incite fear about immigration, technology or jobs. I think, we should look at the bright side and then try to provide some solutions. I hope I can do that. I think Macron has a lot of good ideas. I obviously don’t agree with all of it. But, you know, if he wants to come to the EPP, he is more than welcome. Jean-Claude Juncker said at the start of his mandate this was the “Commission of the last chance”. What would you have done differently in his place, and what do you have to offer for the next period? The Juncker Commission should be given credit and I quite often say that it is not the president that makes the agenda, it is the agenda that makes the president. We forget things. Look what this Commission did. It dealt with the Euro crisis, it dealt with the migration crisis and it dealt with the aftermath of 2016: Brexit and Donald Trump. I think for all intents and purposes, it did a pretty good job. Every Commission and every Commission president is different, so I would probably bring my own personality into the Commission presidency. There is a generational difference: I joke around, I have great respect for Jean-Claude Juncker, because he uses an old Nokia phone. I have an iPhone, a smartphone. I try to keep up to date as I have two teenage kids, 17 and 14 years old, who make sure that I stay up to par with what is going on. I would probably do things a little bit differently. But if you look at the broad agenda, I would focus a lot on technological developments, the digital revolution…Artificial Intelligence, robotisation, the internet of things, 3D printing, digitisation – it will change the economy and work, it will change politics and media, it will change science and probably the future of mankind. I would start addressing these questions very seriously. I have been an avid student of this for a few years and I think it is a fascinating area. We are going to have huge moral and ethical questions. We are going to have questions of economic growth and jobs, about the future, and I think the European Commission needs to be modern on this. We need to be on the ball, otherwise, someone else will be doing it. When we start approaching algorithms taking care of things, I want to have the good guys, rather than the bad guys, do the algorithms. We see traditional parties being in crisis. Have they failed to address people’s needs? What lessons need to be learnt ahead of the European elections? Democratic politics now is much more disruptive than what it used to be before – and much more demanding as well. At the same time, I think we should be honest with ourselves. Politicians are less influential than what they used to be. Life is not about backdoor smoke-filled cabinet room deals. It is more about openness, about transparency. We know that technology has changed individual behaviour, the pattern in which the people think about politics. And once you start admitting that, take yourself down from the pedestal of being some kind of a big leader. I think that is already a step in the right direction. Democracy needs to reinvent itself, that is what is doing right now, and technology can help us to do that. Many people want to see more transparency in European politics, particularly when it comes to the decision-making process in the European Council. Where do you stand on this? I have been pretty much at all levels in politics. In national parliament, in the European Parliament, in the government and in various Council formats. I guess, my rule of thumb would be, that in parliaments you need to have transparent committee meetings and obviously transparent plenary sessions. My experience and recommendation for governments is that many key decisions in governments are born in negotiation and, unfortunately, you cannot do that negotiation in the open, because then it becomes theatre. You need to be transparent about the process, but at the end of the day, we need to have the trust that two or more human beings can have a rational dialogue and can come up with a decision. I was always for transparency on some formations of the Council. For instance, when the Council legislates, it would be good to have open debates; it would be a little bit more interesting. Now, they are done very mechanically – and to be honest, they are quite boring. A European Council in public? I will be very frank with you, I don’t think it would work. It is a very intimate club. Prime ministers and presidents sort of understand each other. It is almost as if you go to a big psychotherapy session, where a lot of these prime ministers come from home with all the pressure that they have and then they come into this room, the 28 of them, plus the Commission president and the president of the European Council and they almost hug each other: “Nice to see you, now we can be ourselves for a little while and discuss European problems”. If it became a show, when you sit in the European Council – the highest decision makers – I am afraid it just wouldn’t work. We need to be realistic about this. In that sense, I would say that transparency has its limits. Would you describe yourself as a feminist? What concrete steps would you have in mind to work towards gender equality in Europe? I am a fairly classic Scandinavian Nordic male and therefore, by definition, a feminist. I am quite proud of that when I was prime minister, the majority of my government were women – 9 out of 17. Out of my party, 4 ministers were women, 3 were men. Was this a goal in itself? No, it just happens because we have bright great women who were able to do that. What kind of policies? Obviously, I am an egalitarian. In that sense, when it comes to working life, when it comes to life in general, family, studies…I don’t see a gender difference. I never wanted to see that. I don’t treat men and women differently. This patriarchal world for me is something quite old school. What would be a measure that I would take? I would try to increase the number of women in the Commission. In the Barroso Commission it was about a fifth, in the Juncker Commission it is is about a third, I would be aiming at putting a target at 40%. Will I achieve it? I really don’t know, but I hope we could achieve it. And the reason I say that the European Commission also needs to reflect the demography of Europe – men, women, all different types of backgrounds, diversity – is great in this sense. And of course, I take gender issues as horizontal to everything that I do. This is what Nordic men are all about, I guess. Call us softies, but I am happy to be a softy on that. You are also very active on social media. How do you rate the code of practice against disinformation and fake news ahead of the elections and the fear of interference? There is definitively going to be interference in the election and I think it is great that the current Commission is working on this with different types of units and people, trying to fend off fake news. We get a lot of cyber-type incidents, for instance from Russia. I mean, I look at my own Twitter feed: When I put out a video – on ‘Europe is about solving problems, not making problems’, or ‘We must stop the Salvinisation of Europe’ – suddenly ‘bang!’ I get fifty to sixty comments which are completely coordinated. They come from different quoters, people who are anti-European, or anti-Western values, and so on and so forth. We going to see a lot of this. It is the sort of new normal. And obviously, we have to work against this. We can do a few things: We have to recognise for ourselves: What is fake news, what are cyber attacks and trolls and the rest of it. Secondly, we also need to educate the young to be able to decide and see differences between fake news and real news. And I feel also the media has an important task on that. We always talk about the media as the ‘Fourth Power’ right next to the legislative, executive and judiciary – the ‘guardian of the people’, the ‘guardian of the truth’. I think it is very important that the media also takes up trying to get the fake news out of the system. In that sense, you have a big responsibility. You label yourself as the “Next Generation Europe”-President. Well, the next generation is currently experiencing poverty, high youth unemployment and will be one of most impacted by climate change. How you intend to tackle this? I see myself as next generation as opposed to previous Commission presidents. But I certainly do not see myself as the next generation in comparison, for instance, to my teenage children. First of all, I think youth unemployment obviously is one of the most serious issues we have at hand. Paradoxically, we have the biggest and highest employment rate in Europe ever, but unemployment and youth unemployment is unacceptable. What do we need to do? We need to understand that the type of life that my generation leads in three phases – study, work, retire – won’t be the reality for the next generation. It will be more like: Study, work, study again, learn a new skill, work, study, work and retirement is probably a sometimes unrealistic prospect. I would give three pieces of advice, when I am asked about what youngsters should do. Number one is: learn how to learn, learn how to analyse. It is not about learning simple or single facts anymore. It is about learning to understand and grasp bigger concepts. The second thing is: learn emotional intelligence, learn empathy, how you treat other human beings. Because as we move towards a society where machines do a lot of the work that we used to do – whether it is physical or mental work – then what is left for us is empathy and the way we treat each other. It is going to be extremely important. And then, finally, learn how to take care of themselves in another kind of way, because your careers will be very different. Your career will be basically on and off and that means that you will need to be able to cope with the pressures of constant disruption. I know these are high fluted suggestions, but I think we need to prepare today’s youth for the digital revolution and the required digital skills, because you and I will not know what the labour market looks like in 2050. And what about climate change then? The two huge issues that we are grappling in the moment are: One, the technological and digital revolution and what that brings with it. And the other one is climate change. For me, both of them are no brainers in the sense that if don’t handle these, we probably are not going to have anything to handle. I mean, we look at temperature increases and latest analysis and of course, scary scenarios of what is going to happen if and when the temperature increases 1 or 1.5 degrees or 2 degrees or even 3 degrees by the end of the century. That would be a situation where we would not need to worry about the basics, because everything is going to be crisis management when human beings cannot live where they are anymore, because of drought, because of floods, because of different types of weather related crises. We just need to keep on working at this. At the moment it does not look optimistic. But I am an optimist. We will find solutions, that is what we humans are there for. When you look at climate change and technology, when you put the two of them together, we usually find solutions. The voter turnout in the European elections was usually very low. How do you intend to get young people to go out and vote? Obviously democracy doesn’t exist unless people are engaged or people vote. And obviously always in the European elections the big question is how to get people to vote. I think you have to capture people’s imagination. And that means that you have to communicate Europe better. You have to say why it matters. You have to say that a member of the European Parliament has more power if he or she is active than a government minister. Every decision that’s taken in the European Parliament is important and if we keep these things in mind, you get people engaged. Paradoxically, I feel that with the election of Trump and Brexit a lot of people woke up to Europe in a different kind of a way. Suddenly, we feel quite emotional about it. I feel emotional about Europe when I watch the Ryder Cup and Europe beats the United States and the rest of it. This is great stuff. We see the European flag and the rest of it, but it goes beyond that. The things people such as Bono are doing right now, waving the flag at concerts, I think it’s fantastic. I’ve never been huge for symbols, but I’ve started to understand that we need to be a little bit emotional, a little bit more engaged, show a little bit more heart rather than just head when it comes to Europe. Europe is a rational choice, but it needs to feel good. Having a more and more inward-looking United States, an assertive Russia and an expansionist China, is Europe facing a period of threats to its economy and global position, or an opportunity to become a global leader? I would say that, because of the voluntary marginalisation of the United States, because of an assertive Russia, and because of an expansionist China, this is actually Europe’s moment. This is the moment when we start seeing power vacuums being created around the world and someone will want to have to fill those power vacuums. And I think Europe can do that. The only way in which you can do it is through being unified in values. We have to put our money where our mouth is. If we preach Western European values around the world in our dignified foreign policy, then we need to have our own house in order. We can’t look through our fingers, when three journalists are murdered, or when member states violate the fundamental human rights or press freedom around Europe. That needs to be rectified. Second, on trade: we are the biggest trading power in the world. We set the rules and now we do great bilateral trade agreements – whether it’s with Canada or South Korea, or Japan, or India and perhaps in the future, also with the United States. We keep on working on that because without trade our economies are not going to grow. And then finally we need to defend multilateralism, multilateral institutions whether it is the UN, the WTO, whether it’s the OECD, whether it’s NATO or the European Union. We need to say that without common rules, common institutions and international law, we have nothing. And if we do these things, I think Europe will survive. A final point: we need to take leadership on climate change and technological development. There is a lot of talk these days about a Europe of different speeds – would this be opportunity or rather counterproductive? You see, asking me about differentiated integration, or multispeed, or core Europe is very dangerous, because I wrote my PhD on this. But I’ll give you a short answer. I think we’ve always had flexibility in the European Union, whether it’s been the Schengen agreement, whether it’s been the euro, whether it’s been defence. There are hundreds of examples of directives and regulations where member states have either derogations or join at a later stage. By definition I would argue that Europe is already flexible. MyPhD thesis, and I still stick to it, is that differentiated integration is a good way of advancing the European integration project. It’s like a nuclear weapon: You can always threaten with it, but never press the actual button, because just the threat forces all of us to join in. I’ll take the euro as an example. I think that at the end of the day, especially now that the United Kingdom is unfortunately leaving the European Union, we will see a day when all 27 member states are in the euro. It just makes sense. I always say this being against the European Union is a little bit like being against the Internet. It’s much better to try to impact and influence the content rather than stay outside. What do you think about Martin Selmayr’s appointment? Well, I would say I’ve worked and seen a lot of Secretary Generals in the European Institutions over the years. I mean, we go back to Niels Ersbøll in the 1980s and early 1990s, or Émile Noël the last secretary general the European Commission, and the work that I’ve done with Martin Selmayr. I’m very impressed. He knows his stuff. I know that in the Brussels bubble there was a lot of heated moments about his nomination. How about German power in general in the European Institutions in general then? I mean, I’ve heard the argument that the there has not been a German commission president since Walter Hallstein. And you know, I speak German, I’m a Germanophone, there’s no question about it. If you look at German relative power in the institutions at the moment, they have great people. The boss of the European Stability Mechanism – German. The boss of the European Investment Bank, great person, Werner Hoyer, my boss when I’m not on a leave of absence – from Germany. The boss of the Court of Auditors – from Germany. The secretary general of the Commission – a German. The secretary general of the External Action Service – German. The secretary general of the European Parliament – also a German. Now, I could continue this list, but I think all of these people are extremely good. Whether or not they are German. But let me turn it around and say: There has never been a Nordic Commission president. There has never been a Baltic Commission president. There’s never been a Commission president from Central Europe or Eastern Europe. Shouldn’t it be time? The EPP has been the defining factor of the EU of today, so I think it would be in our interest if there was no room room for the EPP. They brought us to to this point, clearly they are not up to the job. The populists are simple a symptom of mismanagement. So this guy was vice president of EIB? That’s why we need to drain the swamp in Brussels. Support of values/human rights a.k.a. as open borders for Islam isn’t conserving christianity. So it is clear who should really be kicked out of the EPP. And if you are against ‘populism’ what you actually really are against is democracy. Because what else is the first part of this article but an attempt to make people afraid of the right?